Angostura is probably better known for its aromatic bitters than for its rum. The company’s founder, a German named Dr. Johann Siegert, arrived in Venezuela in 1820 and was later appointed surgeon general in the town of Angostura. Siegert perfected his bitters in 1824 as a remedy for fever, stomachache, and a roster of other complaints. Angostura Bitters became internationally famous by the late 1800s. The company got into rum marketing in the early years of the 20th century, and then opened its own distillery in Trinidad in 1945. 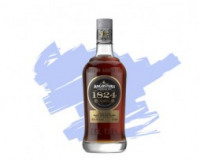 Angostura 1824 is the firm’s flagship rum.